WHO’S IN CHARGE Walking into the Friendly Toast in Burlington tears a hole in the time-space continuum. 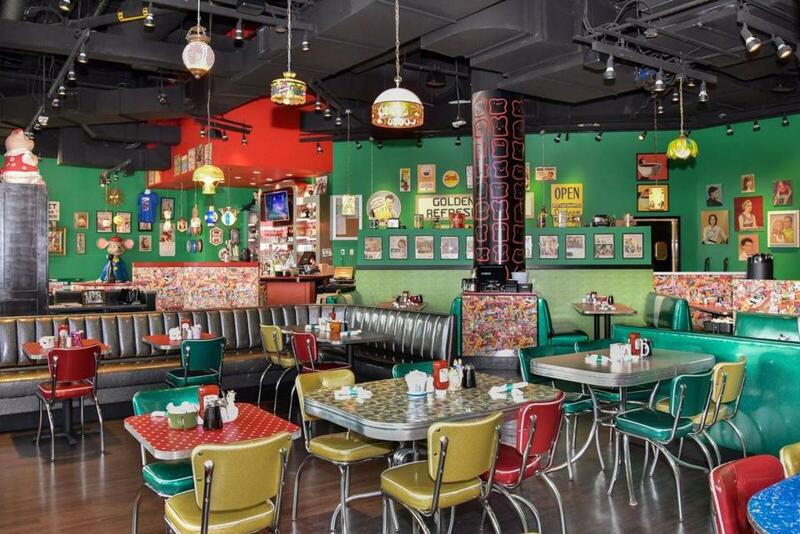 Not only are you surrounded with all that is kitsch from the 1950s and 1960s, but you are in a mirror universe of the Friendly Toast restaurants in Cambridge, the Back Bay, and Portsmouth, N.H. The menus at all four places are exactly alike, with all food under the direction of chef overlord Jarred Baily. Yet each Friendly Toast location is subtly different. All bric-a-brac and artifacts used for decoration are “authentic,” that is, they were collected from antique shops, eBay, yard sales, and, one suspects, some creative dumpster diving. So each place has its own kind of charm, quirky rather than cookie-cutter. Each Friendly Toast also offers its own weekly food and drink specials. The question, however, remains: Does the hipster funkiness translate to a mall setting? We went to Burlington to find out. THE LOCALE I perused a menu under the haughty glare of a mawkish painted poodle that mingles with the pack of schmaltzy dog portraits peppering one of the Toast’s colorful walls. Even better examples of bad art hang near the exit, and one wall is covered by a montage of clips from advertisements and other mid-20th-century motifs. Scott Pulver, who owns the restaurant group with partner Eric Goodwin (a.k.a. the Toasted Brothers), explained that the Burlington location, which opened about a month ago, boasts a display of antique toasters, an 1954 table found on Craigslist, and an oversized rodent dubbed Rusty the Mouse. Most of the items are found by a designated collector who “knows what’s toasty and goes out and finds it,” as Pulver put it. He noted with some pride that he himself had discovered the location’s string of offbeat overhead lights on eBay (keywords: “funky, swag, hanging, lamps”). Pulver, whose partnership bought the two-decades-old Toast business in 2013, said he cautiously weighed moving into a mall when approached about taking over the former Bobby Flay’s Burger Palace in Burlington. He was won over by the location on the “restaurant row” side of the mall. The owners say all the decorations are collected from antique stores, yard sales, and eBay. ON THE MENU Pulver insisted that in the hierarchy of all things Toasty, food quality comes first, then friendly service, then décor. And, indeed, the Toast brand does not rely on a “let them eat kitsch” attitude. The dishes are hearty, the portions generous, the prices reasonable, and the quality good. 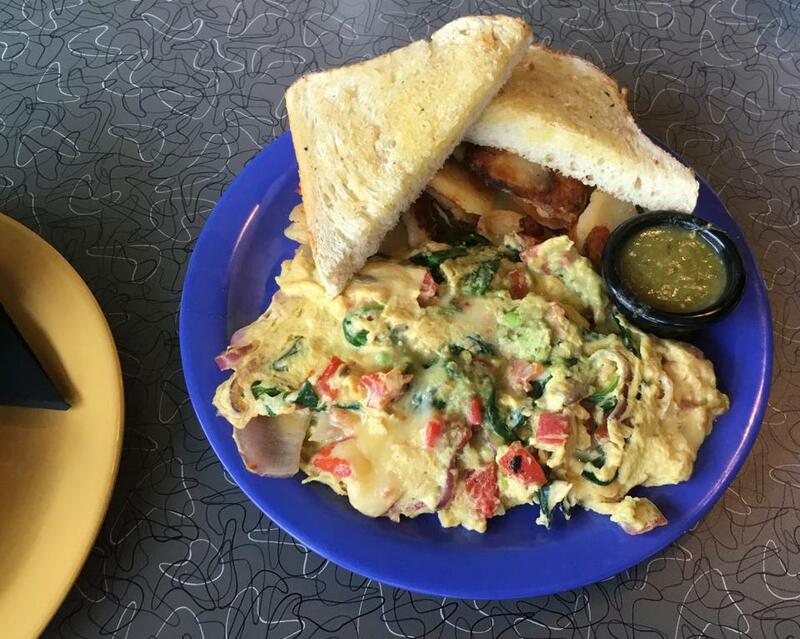 The restaurant is open from 8 a.m. to 10 p.m., and breakfast is served all day. There are also burritos, burgers, sandwiches, salads, and soups, as well as creative cocktails. On a recent visit we sampled the John Scrambo ($14), a tasty egg mix with baby spinach, avocado, roasted red pepper, and tomatoes with jalapeño jack cheese giving it a gentle kick. We also tried the Tacos After Party ($13), three generously filled corn tortillas with scrambled eggs, jalapeño jack cheese, beans, and salsa; the avocado lime sauce gave it special zest. The Costa Rican ($11) was another south-of-the-border twist on breakfast, a couple of sunny side eggs on top of a tasty mound of black beans, corn salsa, and provolone cheese. Those who tend toward the sweet stuff can choose pancakes ($7, $9) with blueberries, chocolate chips, or bananas. There are also gluten-free and vegan style pancakes ($8, $10). The sugar-rush crowd may order the cheesecake French Toast ($13), and you can add a bottle of real maple syrup for $2. The Kale Yeah!!! ($14) wrap proved to be healthy but too bland for us, with egg white, quinoa, carrots, feta, portabella mushrooms, roasted red peppers, and, of course, kale, the Rodney Dangerfield of greens. Tasty, thick-cut toast accompanies most dishes; Pulver said each restaurant bakes 300 loaves a day. Other communities in New England may also get toasty; Pulver said the partners are considering locations in Salem, Burlington, Vt., Bedford, N.H., and Portland, Maine. The Friendly Toast Restaurant and Bar, 75 Middlesex Turnpike, suite 1015B, Burlington. 781-272-9777, www.thefriendlytoast.com. 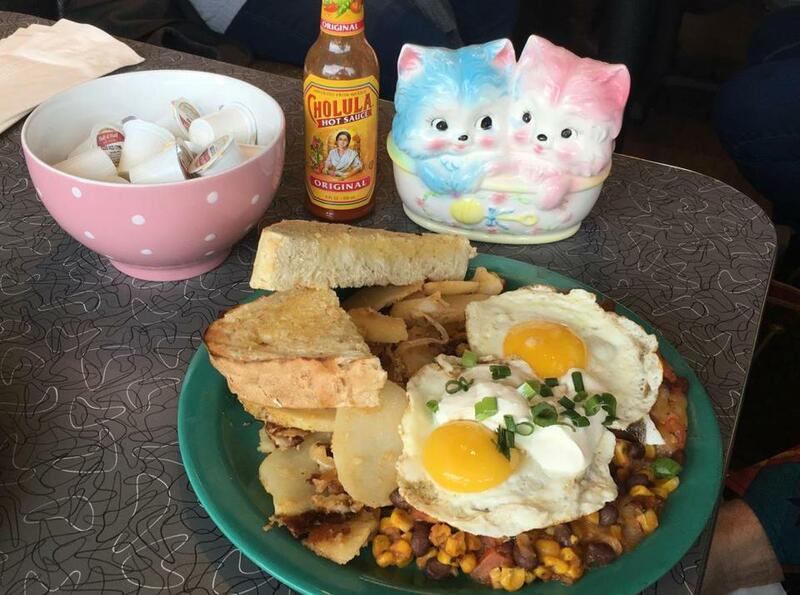 A pair of kittens, hot sauce, and a plate of the "Costa Rican" egg dish at the Friendly Toast.